A surprising view of Sentinel-3A darting through the green flicker of the aurora borealis on its way into orbit has been captured on video from a hilltop in northern Finland. The Sentinel-3A satellite lifted off from Plesetsk in Russia at 17:57 GMT (18:57 CET) on 16 February, about 1000 km away. The footage shows the Rockot launcher as a very bright light scooting across the sky followed by a fainter spot, which could be either the jettisoned first or second stage of the rocket. Clear skies and a good chance of seeing the aurora borealis, the ‘northern lights’, were forecast that night, so Antero Isola, a keen photographer of the aurora borealis , took his cameras to the hilltop Saujapahta outside Karigasniemi and pointed the lens towards the north. “A bright light came towards me from the east, and passed by to the north. It was a special moment with the aurora in the background,” Isola said. Isola caught this rather spectacular sight just over six minutes after liftoff during the firing of the Breeze upper stage of the Rockot. Now safely in orbit around Earth, the mission operations team at ESOC, ESA’s European Space Operations Centre, Darmstadt, Germany, are keeping a close eye on Sentinel-3A during the next few days of its ‘launch and early operations phase’. 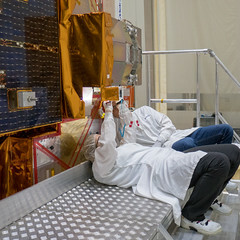 They will then spend the next five months commissioning the satellite to make sure everything is working correctly before it starts its life monitoring the health of our planet. Once in routine service, it will be at the heart of operational oceanography. For example, it will monitor the health of our oceans and measure sea-surface height to follow ocean flow and surface waves – essential for safe marine operations. Such information will lead to better ocean and weather forecasts. It will also monitor sea-level change and diminishing sea ice in the Arctic. In addition, it will map the way land is used, track the state of vegetation, measure the height of rivers and lakes and detect wildfires.